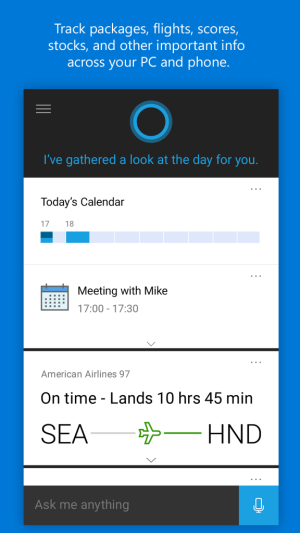 Microsoft promised to bring its Cortana digital personal assistant to iOS and Android in May this year, and public beta for Android came out in July, with a private iOS beta following a few months later. Now both versions have been released, with Cortana available in the App Store and in the Google Play Store, at least for US users. There are some differences in capabilities due to the API availability of the respective platforms. Neither iOS nor Android supports opening apps or changing settings from within Cortana. On Android, "Hey Cortana" voice activation is supported on the Android home screen, but not system-wide. On iOS there's no hands-free voice activation at all. Missed call notifications are similarly Android- and Windows 10 Mobile-specific: miss a call on your Cortana phone, and your Cortana Windows 10 PC will tell you. You can write an SMS to reply to the caller on your PC, and through the power of Internet syncing, the SMS will get sent to the caller from your phone. Microsoft entered a partnership with Android ROM vendor Cyanogen earlier this year. Cyanogen users will soon have access to a special version of Cortana for Android, coming to the One Plus One later this month, and other Cyanogen devices early next year. This special version will lift some of the constraints found in the regular Android app distributed in the Play Store; it will support "Hey Cortana" voice actuation from any screen—not just the home screen—and give control over some settings such as quiet mode and networking. Some of these features seem like they should be available to all Android users; Android 6.0 allows apps to register as the "assist" app—defaulting to the Google App, which provides Google Now—to respond to voice commands whatever is being done. But the integration with network settings requires special support; this isn't something that regular Play Store apps can do. Microsoft says that this special Cyanogen integration is just the start, and that more features will be lit up in the future.